Move over Clash of Clans (and its clones! 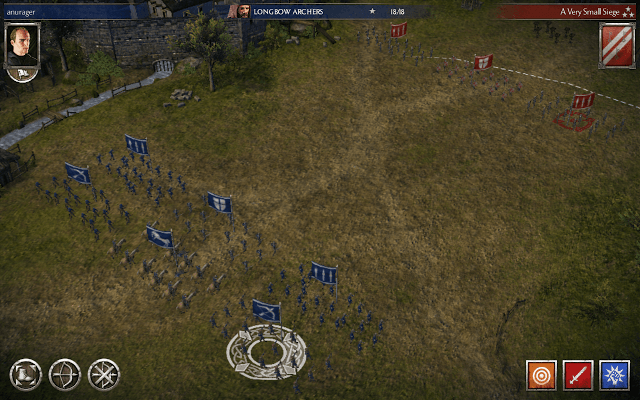 ), RTS gaming just got better with Total War Battles: Kingdom. Despite the small scale RTS battles for mobile, this game will appeal to serious real-time strategy gamers. There are unique construction rules and different types of terrain that makes base-building quite challenging. If you build Blacksmith next to military buildings (including church), you will have worker slots already filled. So if you built a blacksmith next to two military buildings, you will have 2 out of 5 worker slots already filled. You just have to fill the remaining 3 with craftsmen to get a speed bonus. Building a Church next to houses will reduce Order cool down time. Building it close to 4 houses will trigger a 5 percent cool down reduction in an order. 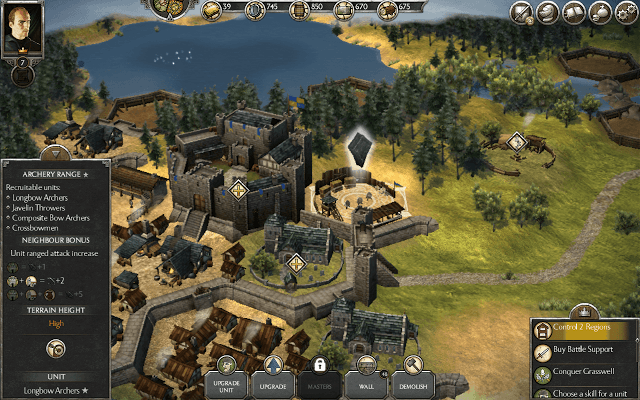 Constructing military buildings next to a castle, church and tavern will increase unit attack. Constructing a military building close to a castle will increase attack (ranged, melee etc.) by 1, whereas if building is close to castle and church or “castle, church and tavern”, attack will be increased by 2 and 5 respective. Building houses close to Market and Blacksmith will produce workers faster. Building it next to a blacksmith will provide a 10 percent increase in housing workers, whereas building it close to a blacksmith and market or blacksmith and two markets will provide 25 percent and 50 percent housing time reduction respectively. Building slums next to Blacksmith, Market and Tavern will reduce the time required to house peasants. 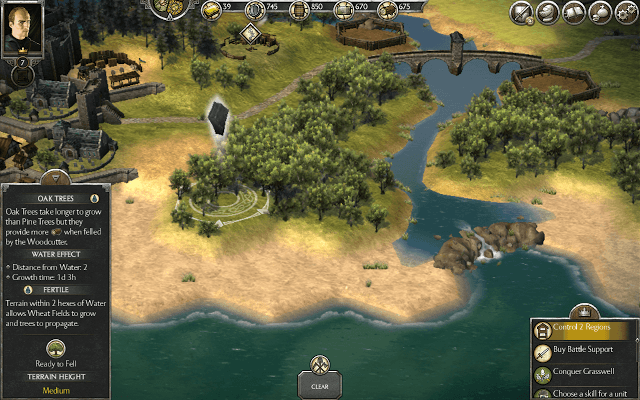 There are different types of terrain in Total War Battles: Kingdom. Dirt within 2 hex of water is considered fertile. Such type of terrain can allow wheat fields and trees to grow. Build a farm next to such terrain and it will sow seeds on it so that you can harvest wheat. If the terrain type is not fertile, you can lower terrain next to a lake to make water flow close to it. This will make it easy for you to grow and harvest wheat on such terrain. Grassy terrain can also be of good use as cattle and sheep are usually found in such terrain. You will have to build a sheep farm and cattle farm close to grassy terrain to slaughter/rear sheep and cattle. Deer can be found close to trees and forest, so if you keep cutting trees for wood, chances of deer appearing are less. Deer can be hunted for a small amount of food. On sand, only slums, bridges and dams can be built. Trees and crops won’t grow on sand. With a woodcutter, you can fell trees to gain wood. Oak tree will give you more wood than pine tree. However, the latter grows faster than the former. Tap on a group of trees to know what type they belong to. Trees grow on fertile terrain. Build a dam to prevent water from flooding your kingdom. Water level rises breaking the dam, so make sure you raise the terrain level behind the dam. Things can get extremely difficult during rains in autumn and chances of water rising to a dangerous level are more in this season, so always build a dam close to a lake to protect from further flooding. Before start of battle, you can check the unit formation of the opposing army. Go to “Battlegrounds” (Tap the first icon on the top-right corner of the screen) and select Missions or Battle Quests. There you will see a snippet of the opposing army’s formation. You can clearly see what units are placed on the front line and the back line. To know what units will attack on the battle ground, just tap a unit card and its name will be shown at the bottom of the formation. Now go back and tap the second icon on the top-right corner of the screen. This will take you to “Army Setup”. Change the formation of your army to rival the enemy army formation you just saw on “Battlegrounds”. Try to place units that are stronger than enemy units on the front line with archers placed on the back line for support. So if the enemy lineup in the front line has cavalry, then you can safely place spearmen on the front line of your army. You can place your idle units on empty slots or slots already occupied by other units by just tapping your idle unit’s name in the list and then tapping the slot where you want to place it. Your idle units will be shown under “Militia”, Soldiers etc. Tapping on an idle unit will make all slots glow. Swordsmen are stronger than spearmen and lightly armored enemies, but can be easily defeated by cavalry/plunderers. Levies/spearmen are armed with long spears and can be very effective against mounted units, but they can be easily decimated by swordsmen and other footmen. Axemen can be a safe bet against heavily armored troops, but they shouldn’t be pitted against cavalry. Macemen should be placed in front of an enemy unit wearing soft armor, such as leather and chain mail. Can be effective against anyone except knights cavalry. 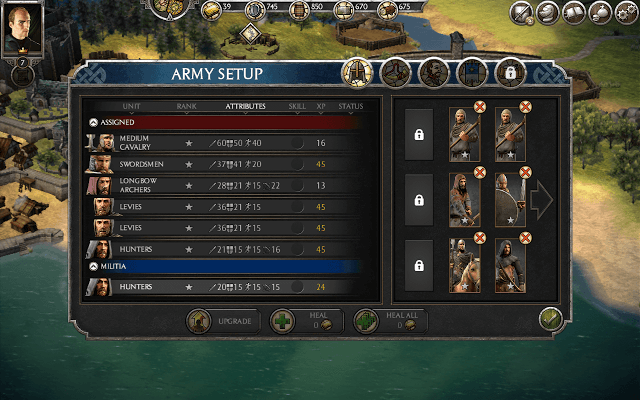 Light cavalry can be a good bet against unguarded archers and melee units, but can be easily defeated by spearmen. Marauders are lightly armored units and are vulnerable to arrows and swordsmen. Longbow archers’ range is long, and they can easily pierce heavy armor. Javelin throwers can take out heavily armored troops. Composite bow archers have a shorter range than longbow but they fire faster than them. Total War Battles: Kingdom has an excellent “Charge” battle system where a player may get an attack boost after tapping the charge arrow at the right moment. When a big arrow appears over your unit, don’t just tap your unit right away. Let both enemy unit and your unit come a bit closer to each other. You should tap on your unit to make sure the charged arrow becomes yellow or green in color exactly when both units meet. If it already becomes green when the enemy army is a bit far away, it will charge again and probably will fail to get a Good or Perfect charge. If you tap a unit to charge it when enemy and your units are too close, then it won’t charge as the enemy units will be too close and probably start attacking. Timing is key to achieve a better charge, so practice more by playing Missions. When there’s no enemy in front of your units, you can use taunt to provoke an idle enemy unit to fighting your idle unit. Taunt can be an effective way to engage units in the back line. When the provoked enemy unit starts battling your units, use a church order like “Slay Them All” or “War Cry” for your melee units. Such orders can be extremely effective in defeating enemy units. Be careful not to use taunt against a powerful enemy unit. Use taunt only when the unit is weaker or even. Houses will provide workers who can be assigned to various jobs like managing tavern or working at the blacksmith. The workers provided by slums and houses will be added to your town’s workforce. Tap the castle to check how many idle workers are there and assign them to jobs. The blacksmith requires full workforce, but make sure you assign craftsmen and not workers if you want a speed bonus. Assign 5 craftsmen if you want a speed bonus. If you assign only craftsmen to Blacksmith, silver will be produced at a faster rate. You can train workers to become craftsmen at the castle. You need 10 workers to create a craftsman. Collect workers from slums and houses and train them to get craftsmen. In case you are in a hurry and don’t want a speed bonus, you can assign normal workers to a blacksmith and other buildings to get resources. Houses, blacksmiths, taverns, market, mansions and all military buildings must be built next to active town buildings. They can’t be built far away from your castle or its surrounding buildings. Only Farm, Woodcutter, Quarry and other resource producing buildings can be built far away from other buildings. You cannot build farm, woodcutter, quarry, church, barracks and most buildings on sand. However, slums can be built on sand. Slums produce peasants, who can be trained to get a craftsman. Build (and upgrade) more slums on sand to get more peasants. Make sure you have collected 10 peasants before turning them into a craftsman. You can build another quarry, but it should be 5 hexes away from another quarry. A bridge can be built next to a road, bridge or town building on medium terrain. A Road can be built next to a road, bridge or a town building on medium terrain. You can’t raise a terrain if the surrounding terrain is too low. Similarly you cannot lower terrain if the surrounding terrain is too high. Don’t wait for enemy army units to come within your archers range. When the battle starts, tap your archer unit and then select the enemy unit right away to inflict early damage. I prefer taking out units in the last or second line. When battle begins, I select my archers and tap on enemy units in the back line without wasting any time, even before they come into their range. Just assign targets to your archers and the target symbol will move along with them and when they come into your archers range, they will keep firing until enemy units are defeated. Composite bow archers can be a great addition to your army as they fire at a faster rate. Does anyone know what the First Blood and Second Blood bonuses are? Are they just defeating an entire enemy unit before they wipe out on of yours? Cheers. Fairly certain it says ‘Two OTHER rank 1 castles’ – so three in total. If not, is part of your road flooded? I had that and it took me a wee while to work out what was going wrong. Good luck lad! Hi. I have been playing total war battles kingdom for some time now. I have two rank one castles and I have built a road to connect them. But It still isn’t connected. That’s why I can’t upgrade anything. Please help.